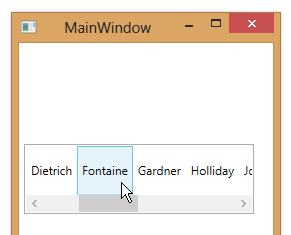 You can make a ListBox render its items horizontally, rather than vertically, by setting its ItemsPanel. In the example below, we set the ItemsPanel to a template containing a horizontally-oriented StackPanel. (The default is a vertically-oriented StackPanel). Thanks for the great tips! This helps a lot!